Hosted by Seapark AC, 800 athletes took to the streets of Carrickfergus on Sunday 27th August for the annual ‘Storming the Castle’ 10k road race. With ideal weather conditions this fast, flat provided runners with the opportunity for personal bests. Kent Swann (North Belfast Harriers) led the field home in a time of 34.53 (1st place). With James Budde (North Down AC) a close second in 35.07. Joe Malone (North Belfast Harriers) completed the podium in 35.10. In the ladies race Anne Terek (City of Lisburn AC) won with a time of 39.39. Julie Murphy (Lagan Valley AC) took second place in a time of 40.24, while Debbie Matchett (Ballydrain Harriers) crossed the line in 40.49 for third place. Bryn Edgar (Springwell RC) had an excellent race, winning the M55 age category and 12th overall in a time of 38.36. Springwell RC - 12th Bryan Edgar 38.36 (1st M55), 94th Mervyn Thompson 46.12, 104th Jean Claude Bourgeois 46.39, 110th Paul Quinn 46.40 PB, 130th Stephen Smyth 47.29, 161st Noel McAllister 48.43, 272nd Laura Wilson 53.01 PB, 369th Margaret Edgar 56.57. The Armagh City Marathon also took place on Sunday 27th August and Chris Denton (Springwell RC) continued his excellent form with another sub 3 hour marathon of 2.52.15 to finish third. In the half marathon Louise Hanna (Springwell RC) ran 1.58.31 to finish 35th. The event also incorporated a relay event with a team of four covering the marathon distance. 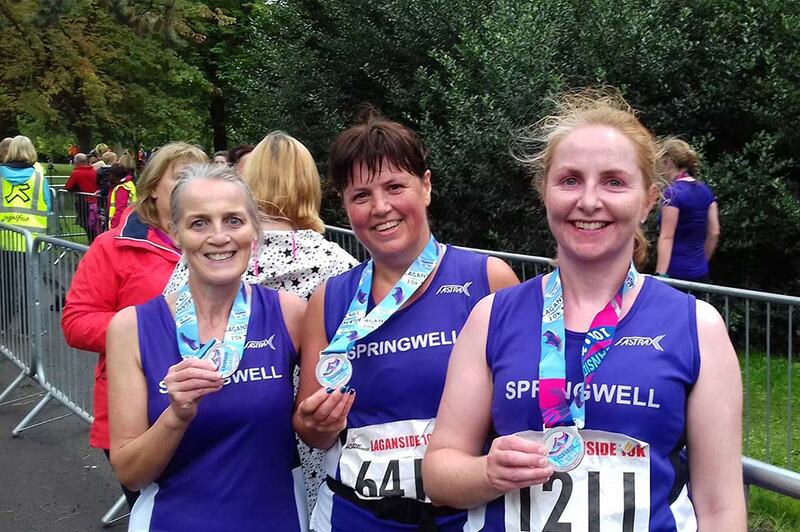 Competing under the name ‘The Running Dead’ the Springwell RC quartet of Andrew Kincaid 1.04.53, Stacey Lyttle 1.30.59, Julie Corbett 1.05.03 and, on the anchor leg, Janet Patrick 56.31 finished 30th with a time of 4.37.25. Hosted by Rasharkin Runners the charity 5 & 10k Run for the Hills too place on Saturday 2nd September at the Moneyleck Road in Rasharkin. In the 10k race Alex Brennan (Ballymena Runners) led the field home in a time of 38.37. Bryan Edgar (Springwell RC) took second place in 40.21 with James Stewart (Springwell RC) completing the podium with third in 40.27. In the ladies race Veronica Nellins (unattached) took first place and 8th overall in 45.28. Louise O’Donnell (Springwell RC) was second and 20th overall in 54.59 and in third and 21st overall Sharifa O’Kane (unattached) crossed the line in 55.05. Springwell RC - 2nd Bryan Edgar 40.21, 3rd Jimmy Stewart 40.27, 6th Raymond McCann 42.59, 20th Louise O'Donnell 54.59 (2nd lady), 22nd Mary Brogan 55.35, 25th Margaret Edgar 57.51. The very popular Waterside Half Marathon attracted over 1700 runners to the city on Sunday 3rd September to take on the course. The heavy, overnight rain which had left some very large puddles for the runners to negotiate stopped in time for the start of the race. The course started in Ebrington Square and took competitors along the Limavady Road and around Gransha Park before they faced the challenge of the climb over the Foyle Bridge. Once recovered from the climb the course continued along the River Foyle onto Queens Quay and out to Coshowen before turning back along the river to cross the Peace Bridge and finish on the running track in St Columbs Park. Springwell RC’s Ricky Wilson and Jim O’Hara take on the Foyle Bridge at the Waterside Half Marathon. The mens race produced one of the closest ever finishes with the dip on the line making the difference between first and second. Freddy Sittuk (Raheny Shamrock AC) took victory by a second from Declan Reed (City of Derry AC) finishing in 1.09.18 with Declan 1.09.19. Scott Rankin (Foyle Valley AC) finished in third with 1.10.18. In the ladies race Catherine Whoriskey claimed her third successive WHM title in 1.20.41. Deborah Gray (Bellahouston Road Runners) finished second in 1.29.04 and Catherine McKinley (Letterkenny AC) completed the top three with a time of 1.29.54. Springwell RC had a large turnout of members at the even with Hugh Boyle continuing his excellent form with another M65 age category win, finishing 104th in 1.30.22. Springwell RC - 39th Stephen Joyce 1.23.56, 93rd Jason Scott 1.29.38 (Pacer 1.30), 102nd Anthony Higginbottom 1.30.11, 104th Hugh Boyle 1.30.22 (1st M65), 105th Eddie Clyde 1.30.17, 113th Jeff Young 1.31.21, 175th David McGaffin 1.35.30, 177th John Butcher 1.35.36 PB, 194th Timothy Bacon 1.36.38 PB, 233rd Davy MacNichol 1.38.32, 302nd Kenny Coulter 1.42.07, 351st Glenda Whiteside 1.43.53 (Pacer 1.45), 352nd Darren Madden 1.44.10 (Pacer 1.45), 372nd Will Colvin 1.44.57, 381st Paul Irwin 1.45.14, 406th Ricky Wilson 1.46.01, 411th Paul Quinn 1.47.00 PB, 419th Martin Smith 1.46.19 PB, 468th Alwyn Hunt 1.48.56, 493rd Mandy Stewart 1.48.18, 508th Lynne Young 1.48.42, 547th David Gault 1.50.01, 548th Maxine McGregor 1.50.02 PB, 549th Noel Harkin 1.50.08, 556th Kieran Cooke 1.50.19, 575th Jim O’Hara 1.51.17, 603rd Paul Humphreys 1.52.18, 613th Geoff Glass 1.52.04, 665th Elizabeth Deighan 1.54.23, 666th Ali McAllister 1.54.13, 871st Gregory O’Brien 1.59.24 (Pacer 2.00), 1097th Brenda Burns 2.05.51 PB, 1224th Elaine Montgomery 2.10.47, 1338th Colin Connolly 2.14.36 PB, 1352nd Jonathan Lynch 2.15.55 PB, 1476th Karen Robinson 2.23.46, 1554th Helena Dornan 2.28.18 (Pacer 2.30). On Sunday 3rd September over one thousand runners turned out for the Laganside 10k road race, sponsored by Pure Running and hosted by North Belfast Harriers. The race was also part of the ongoing Novosco 10k Grand Prix Series. Blustery conditions reduced the chances of fast times, but it took nothing away from an excellent race. Both the male and female races went to the wire – in the end, reigning Champions Mark McKinstry (North Belfast Harriers) and Laura Graham (Mourne Runners) successfully defended their titles. In the Mens race Mark McKinstry (North Belfast Harriers) retained his title from last year, winning in a time of 32.01 from Chris Madden (City of Lisburn AC) who finished in 32.11 just ahead of Lindsay Gordon (North Belfast Harriers) who completed the podium finishing third in 32.12. In the ladies race Laura Graham and Gladys Ganiel O’Neill (North Belfast Harriers) went stride for stride until the final stages when Laura surged towards the finish line to tae victory in 35.26. Gladys finished second in 35.37 before Jessica Craig (North Down AC) crossed the line in 36.59 for third place. Springwell RC had 48 members out and about parkrunning at 6 different venues. 4 personal bests were recorded and Kenny Bacon completed his 90th parkrun in Leeds.